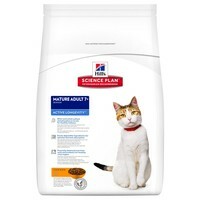 Hills Science Plan Active Longevity 7+ Dry Food for Mature Cats provides complete and balanced nutrition for older cats over the age of 7. Made with a special kibble that older cats find easier to chew, the food also contains specialised nutrition that supports the immune system, kidneys, gastrointestinal health and joints of your cat. Hills Active Longevity contains everything your cat needs to live a happy and healthy lifestyle. I decided to get this in the Tuna for my 10 year old female cat. Since I lost my other cat, Tammy has been depressed and not well. She has got urinary tract problems because of the stress. She took to this straight away and loves it. She is a lot happier now and this is definitely the one I am keeping her on. I would recommend this to owners who have elderly cats, it will keep them in tip top condition. For health reasons our twelve-year-old cat can only have dry food. The vet recommended this product (and the tuna variety) and it has kept her in good shape. Very pleased with it.